Browsing through various options of themes can help you in choosing the right fit for your music website. Your wish list of functionalities would include a media player, event planner, online stores and a lot more! 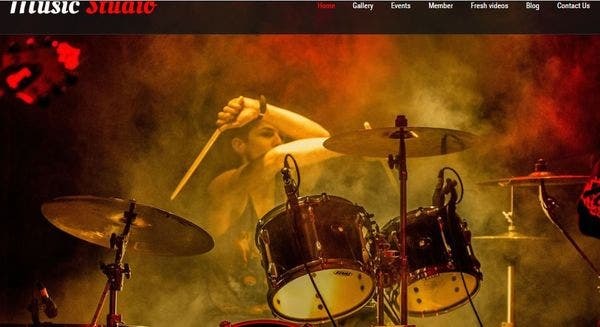 Here is a list of the best Music WordPress Themes to make your website attractive and eye-catching. These are easy to implement and do not require much time and expertise. 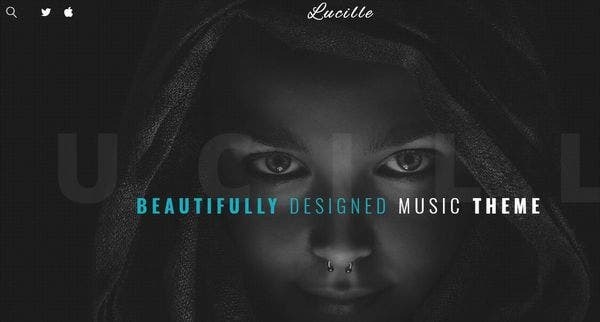 Lucille is a fully responsive theme, specially designed for musicians, artists and, music bands. The highlights of the theme are flexible wave player and custom type posts. There are numerous fonts and readymade templates to choose from. 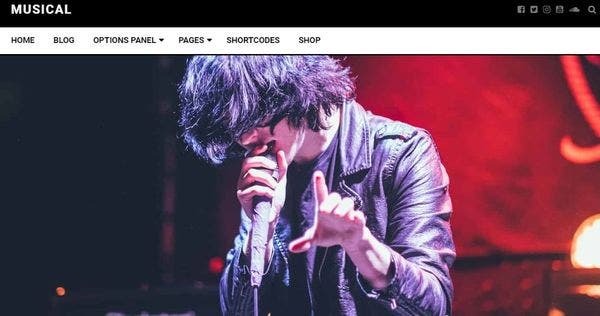 This musician WordPress theme also has custom meta boxes that allow you to personalize individual pages! Musical is exclusively designed for entertainment websites. 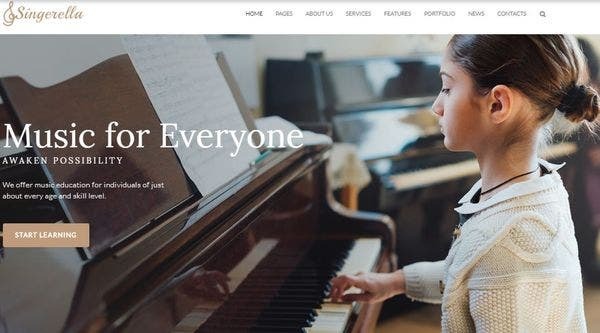 Music WordPress theme comes with a clean and minimalistic design. The theme is perfect for music bands, entertainment bloggers, musicians and DJ’s. It allows for maximum design flexibility with unlimited colors, background options, custom widgets and multiple sections that are too good to be free! 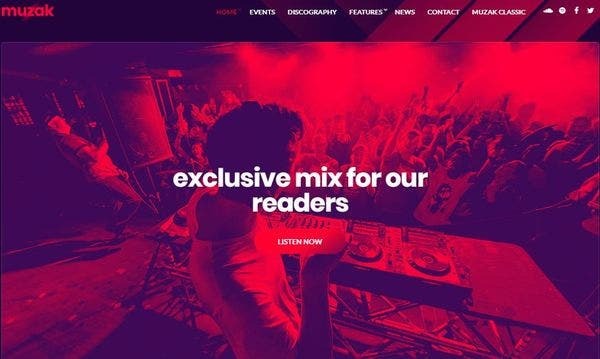 Beatswave is the ideal choice for music websites. 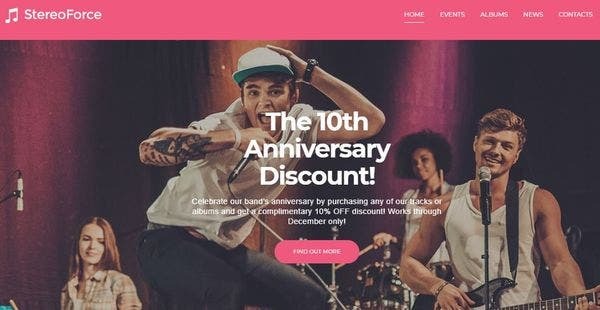 The music festival WordPress theme is curated with premium features like audio player, video and album post format, and a lot more! Plugins like visual composer greatly enhance the functionality of your website. On top of all that, Beatswave also allows for social media integrations. 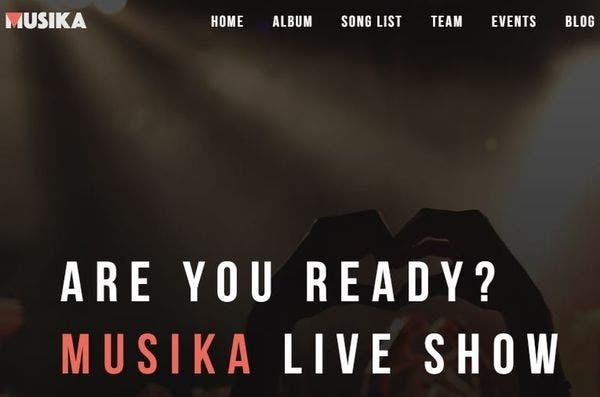 Musika music production WordPress theme is designed for musicians and music bands, who wish to create a strong online presence. The customization options are expansive with various home versions, blog styles and pages like team, video and, albums. The theme also has integrations with Music press, The Event calendar and, TZ gallery pro. If you want a dramatic layout for your website, Slide is just the right choice. 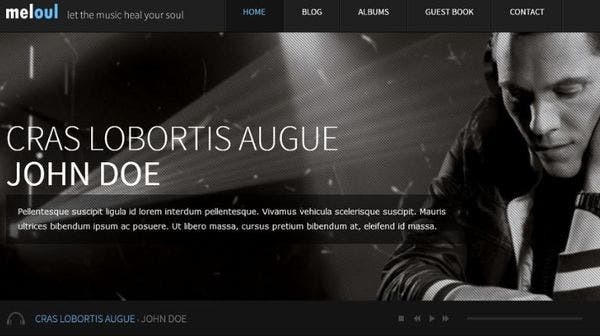 Best suited for artists and musicians, the theme has 20+ music-oriented page builder elements! Revolution slider enables you to arrange your content in the best possible way. The theme also social media ready theme. 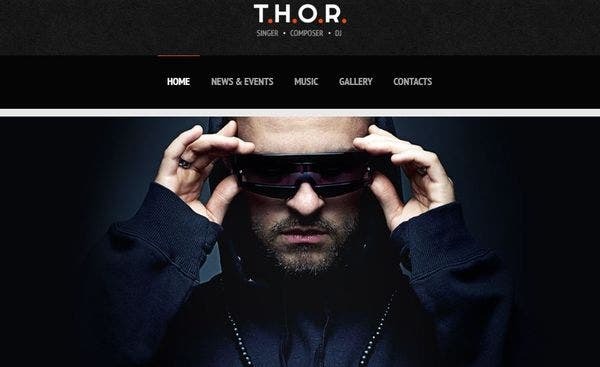 Glorio is a stylish WordPress theme, designed for music studio websites. The theme has a responsive and retina ready interface. Being SEO optimized, it drives maximum traffic to your website. Gloria is also integrated with WooCommerce and the best part is, you get free installation and updates for a lifetime! 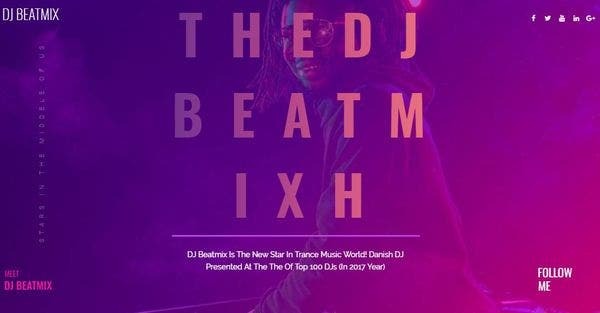 DJ Beatmix has a stunning and user-friendly interface. It is equipped with JetElements plugins, which helps you to fully customize your website. Features like google fonts, live customizer and, easy installation makes it a popular choice. The music school WordPress theme also integrates with Ecwid, so you can also have an online store! 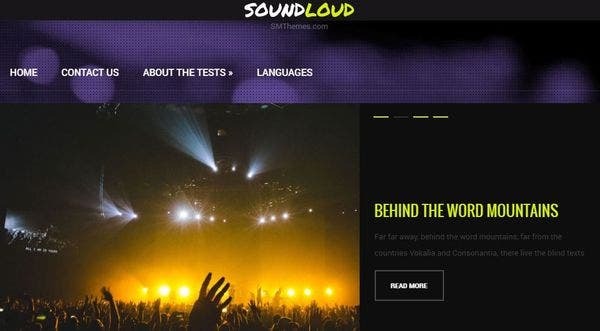 Soundcloud is one of the most impressive stunning WordPress themes. Colorful designs, responsive layouts and, highlighted captions make your content extremely attractive and intriguing. The theme is compatible with the latest WordPress versions. It is also integrated with Ecwid and WooCommerce, which means you can have your own online store! 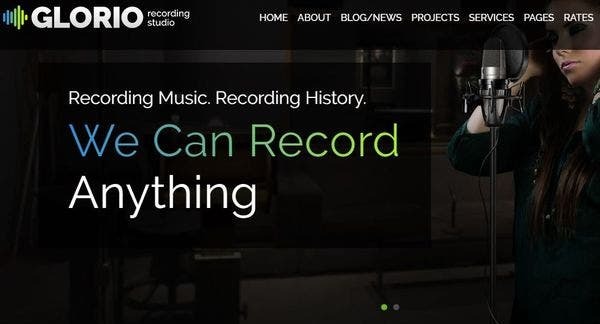 Meloul is best suited for music websites. It allows you to upload music products like audios and videos with great ease. It has a fully responsive layout, which means it works well with laptops, mobiles and, tablets. The responsive WordPress theme is compatible with browsers like Chrome, Opera and a few others. Music Studio is best suited for musicians, rock bands and music studios. It has a highly responsive and mobile friendly interface. Features like music playlist, creative icons, tour dates section and image gallery are responsible for the popularity of the theme. The SEO friendly theme is compatible with the latest WordPress versions. Singerella professional WordPress theme comes with the latest drag and drops technology. Which means you can build your website without a single line of code! It has all that you need to create your music website, widgets, bonus images, cherry plugins and so much more. Also, the inbuilt Live customizer makes editing super-easy. 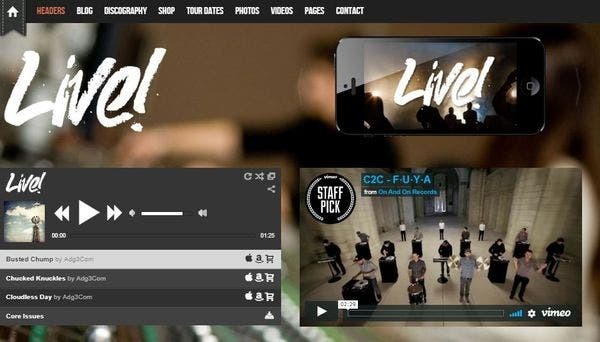 Live is a fast and modern WordPress theme designed for musicians. You can customize the fonts, colors, and other visual styles and choose from various background possibilities like video, images, sliders and so much more. The WPML plugin ensures wider global coverage and the contact forms connects you with your customers. 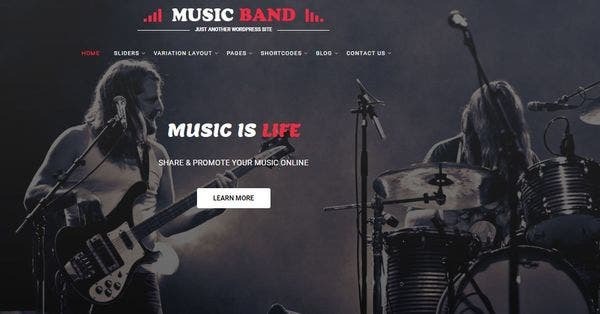 Designed for music bands and musicians, Music band comes with a 100% responsive layout. Being SEO friendly it drives maximum traffic to your website. Innovative modules, cherry plugins, multiple layouts and, custom widgets greatly enhance the performance of your website. Animations and parallax effects take user experience to another level! Music multipurpose WordPress Theme is responsive, fast, interactive and loaded with the best of features. It is ideal for bands, musicians, and various other entertainment businesses. The theme gives you the best audio and visual experience. With multiple layout options, powerful plugins and custom widgets, it gives you maximum design flexibility! 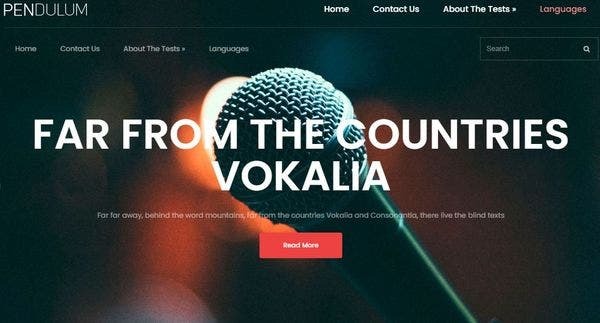 Original Singer is retina ready WordPress themes with an aesthetic layout. It has templates for FAQs, testimonials and various other elements that will make your website credible and eye catchy. The package includes some amazing features like calendar, tag cloud, commenting system, advanced theme options and many more. Muzak is one of the multilingual WordPress themes. It has a super-efficient event management system, which lets you schedule and manage events effectively. The theme is equipped with custom post types, page templates and, custom widgets. It is compatible with Safari, Chrome, Firefox and a number of other browsers. 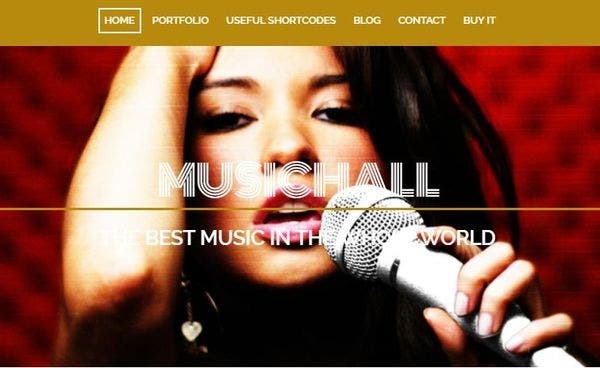 What makes Music Hall a top-notch music theme is an ease with which it allows you personalize individual pages of your website. 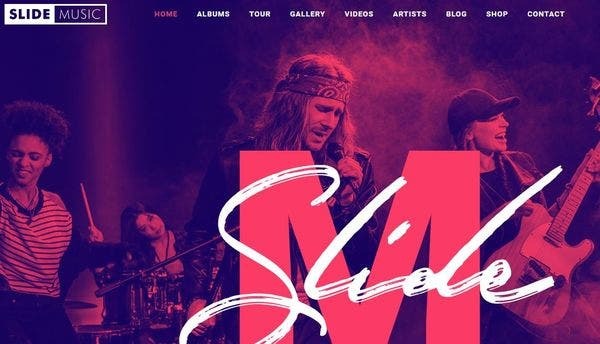 Equipped with shortcodes, cross-browser- compatibility, unlimited colors and theme customization options, the theme is a perfect fit for musicians and music bands, looking for better online presence. 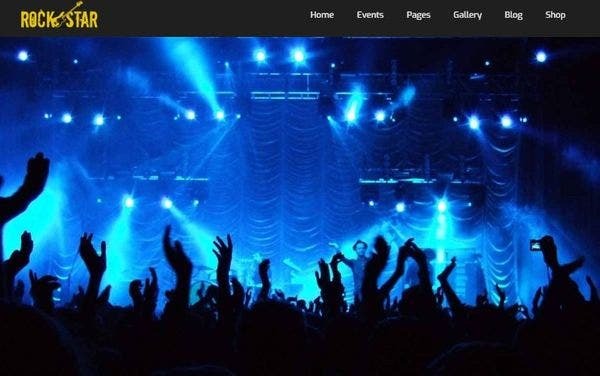 Pendulum HTML5+CSS3 WordPress is ideal for music portals. It is responsive and translation ready. You can customize the color and fonts and choose from various background possibilities like sliders and images. The theme also allows you to implement social icons, by which your customers can visit your Facebook and Instagram pages. 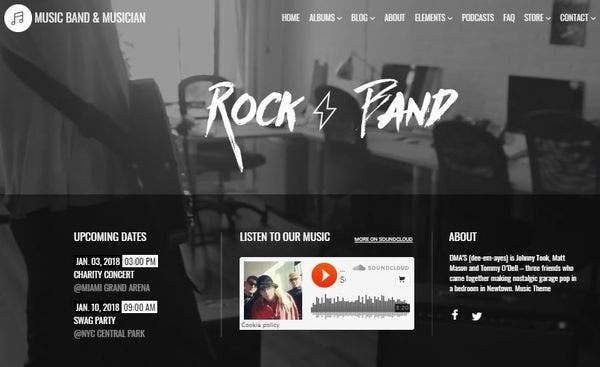 Rockstar is a beautiful and responsive WordPress theme designed for musicians, bands, DJ’s and various other entertainment websites. With advanced typography, unlimited color options and custom backgrounds it gives you maximum design flexibility! The theme also has translation ready elements, which enable you to switch languages and thereby increase coverage. 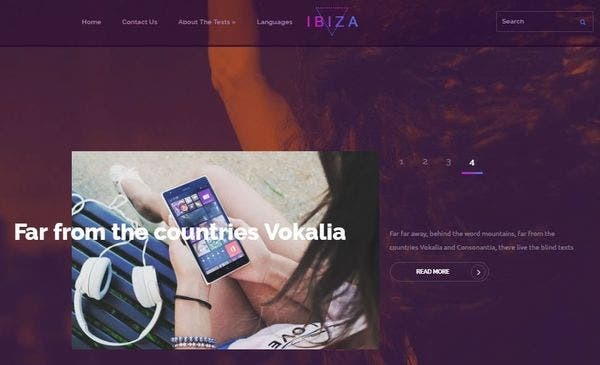 Ibiza is one of the most elegant as well as responsive music WordPress themes. Elements like thin lines and semi-transparent backgrounds will impart an aesthetic look to your website. The theme is compatible with the latest WordPress versions. Being SEO optimized, it also helps you rank better in search engines. From an in-built music player to multiple color themes, Music Producer has all the features you need, to create a top-notch music website. The theme is compatible with the best page builders like Visual Composer, Beaver builder and many more! The WooCommerce plugin enables you to sell your products online. Lush is one of the most popular music WordPress themes. The highlights of the theme are discography widgets and an audio player. It also has a 3D menu, revolution slider and parallax effects which will greatly enhance the visual appeal of your website. The mail chimps tool facilitates communication with your customers. 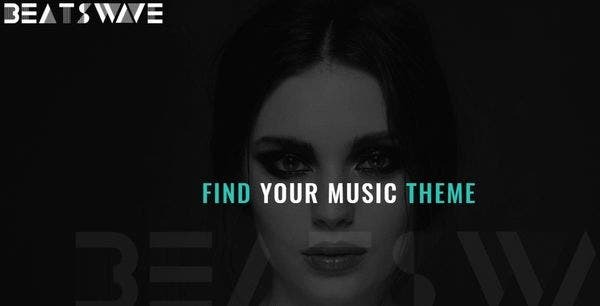 So, these were some of the best themes for your music website. We are pretty sure you’ll have a tough time choosing the right one!